Last autumn, I was at a conference in Rio de Janeiro (it’s a hard life but someone’s got to do it!) and the main conference dinner was held at the Copacabana Palace Hotel, a rather beautiful 1920s grand hotel, overlooking the beach. On our way up to the ballroom for dinner, I noticed a “rogue’s gallery” of photos of famous guests on the walls of the corridor. Most were recognisable - assorted royals, politicians, Hollywood icons and rock aristocracy - but one picture, a bespectacled late middle-aged man, totally foxed me until I checked the name plate. It was Stefan Zweig. This acted as a reminder that I needed to get this post done (a reminder that obviously had little effect, given the time it has taken) and was a bit of a curiosity as I was unaware at the time that his flight from the rise to power of the Nazis in Germany had eventually led him to Brazil, where he was ultimately to commit suicide in 1942. Chess is a novella, published in 1942, very shortly after Zweig’s death. The unnamed narrator is a passenger on a ship headed towards Argentina from New York. Recognising a famous chess master on board, the narrator persuades a fellow passenger by the name of McConnor to play a game of chess against him in the hopes of luring the master into a match. With this ploy having been successful, the hapless McConnor is being beaten by the master when an unknown stranger approaches and starts giving McConnor instructions on how to play, which result in McConnor being able to turn the game completely around and to salvage a draw from a seemingly hopeless position. The novella then veers off on a tangent to give a potted biography of the mysterious stranger, a Doctor B. from Austria, before returning to the shop and to the two games Dr B then plays against the master and their fateful consequence. There is at least one, if not two, decent books fighting for space within Chess but, unfortunately, Zweig didn’t seem able to realise either of them. On the one hand, there is a nice psychological mystery, centred on the game of chess itself and on the identity of the mysterious Dr B. On the other hand, there is also a novel examining the psychological and emotional consequences of torture, isolation and obsession, revolving around Dr B’s imprisonment by the Nazis, following their takeover of Austria in the 1930s, and their reprisals against those, like Dr B., who had been close to the Hapsburg monarchy. The obsession part of the mix arises from the tactic Dr B uses to combat the effects of isolation - a tactic I won’t reveal as it is the key plot point in the novella. Either of these books would have been compelling if Zweig had fully written them and, to be fair, the novella in its published form is an enjoyable read (especially, if like me, you find Nazis and games to be hooks in stories!). 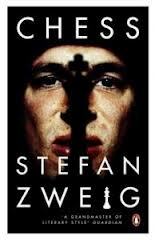 There is an authentic air of fear and suspense running through it, stemming from the fear of the Nazis that Zweig would have felt as an Austrian Jew who went into exile in the 1930s and it could also be read as a study of the two different approaches to chess of the master, an apparent idiot savant, and Dr B., the ultimate book-taught player. Nevertheless, it felt almost like a skeleton from which something better could have been constructed. I should finish by saying that this view isn’t necessarily shared by other, more qualified, readers and many people view Chess as one of Zweig’s masterpieces. I don’t, but can see that his other work could be very interesting to read. Sorry to be so late in commenting - I meant to when this post was initially published but got distracted somehow. Have you read Luzhin's Defense by Nabokov? (Maybe it's just "The Defense" I can't remember just now) It's about a kind of idiot-savant master like the one on board the ocean liner in Zweig's book. I have never really been a chess player. I know the rules but that's about as far as it goes. I guess I have very little eye for strategy. I've made a note of the Nabokov book you mention - although I don't (and can't) play the game, I have a certain amount of fascination about it.